The Steem Radio Waves are fairly placid this week. Just one new show picked up on the radar. 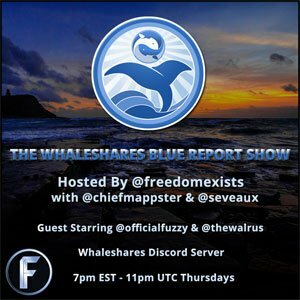 The Whaleshares Blue Report Show with @freedomexists, @chiefmappster and @seveaux airs on Thursdays from 11pm UTC. With the coming launch of the new Whaleshares platform @freedomexists is launching a new format show The Whaleshares Blue Report Show. The show will start with a news segment, followed by a Coffee 'n' Crypto session with @chiefmappster. Next up will be a music session with @seveaux. The show will also feature a Community Curation session, as well as a discussion with an invited guest. I believe I will be the guest this coming Thursday ! 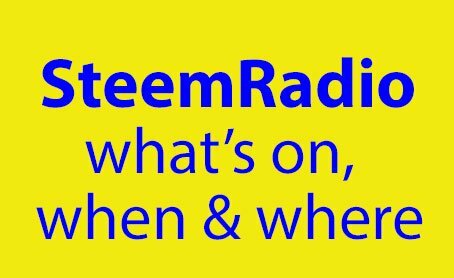 The guests for this week's My Life in 8 Songs show on Thursday will be @yidneth, @entrepreneur916 and @steemcafe. Guests on this Friday's Alternative Lifestyle Show are still being finalised, but we should be joined by @cecicastor and @chrisabdey who will be updating us live from Nicaragua on the ever deriorating situation in that country. We should also have @buzz.lightyear from Malaysia talking about his new EMPOWER renewable energy blockchain project. Friday's show will also include an update on my A Dollar A Day charitably giving project that started last month. I am always on the lookout for more guests for future shows. If you have in any way an alternative lifestyle and would like to tell the steemchain about it please do contact me via a comment below or on Discord @Pennsif#9921. Sure thing. When is your new show starting? Just send me the details on Discord and I will add it in. I love that you announce all the shows. This is a lot of work to put together and keep updated too. Thanks so much for doing it. Could I ask that you add a link to the mspwaves google calendar? @dflo created it and it presents the shows in local time for whomever clicks on it. What say you? That will be no problem - what is the link for that? You received an upvote from @MusicVoter and people following my Curation Trail due to the musical content of this post.